Timings shown are door times. 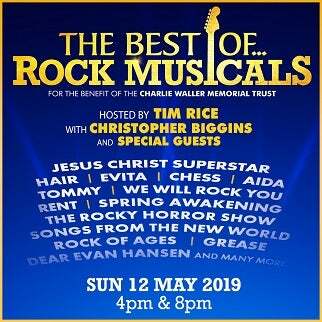 On Sunday May 12, 2019 at 4.00pm and 8.00pm, there will be two concerts of The Best of… Rock Musicals for the benefit of the Charlie Waller Memorial Trust. It will be the 20th Anniversary production from the same team who for the last 19 years have presented The Night of 1000 Voices at the Royal Albert Hall and elsewhere. Hosted by Tim Rice with special appearances by Christopher Biggins and Guests. Hosted by the god-father of rock musicals, Tim Rice, The Best of… Rock Musicals will feature London’s Kerry Ellis (Wicked) and New York’s Adam Pascal (Rent) and Judy Kuhn (Les Misèrables and Chess); Europe’s Kristina Love (Tina), Christian Lund (The Phantom of the Opera) and David Michael Johnson (Jesus Christ Superstar) together with a host of Broadway and West End talent including Ricardo Afonso, Sabrina Aloueche and Noel Sullivan (We Will Rock You), Elvie Ellis (Hairspray), Rachel Fabri (Jesus Christ Superstar), Charlotte Harwood (Loserville), Emma Hatton (Wicked), Rob Houchen (Les Misérables), Emma Kingston (Evita), Debbie Kurup (Sweet Charity), Jon Robyns (Hamilton), and Ray Shell (Starlight Express), the West End Chorus, the City of London Philharmonic AllStars, all lead by national treasure, Christopher Biggins, and some very special surprise guests. Amongst many others, The Best of… Rock Musicals will include songs from Jesus Christ Superstar, Hair, Evita, Chess, Aida, RENT, Tommy, We Will Rock You, Spring Awakening, The Rocky Horror Show, Next To Normal, The Little Shop of Horrors and Dear Evan Hansen. The Charlie Waller Memorial Trust was formed in 1997 by the Waller family in memory of their son and brother, Charlie, who took his own life whilst suffering from depression. The Trust offers support and education to those affected by depression and mental illness. Its vision is of a world where people understand and talk openly about depression; where young people are educated on the importance of staying mentally well, and where treatment is available to everyone who needs it. Particularly in musical theatre and the performing arts, where depression and mental unhappiness is often masked by a smiling face. Everyone has a duty to protect each other in a profession where rejection and redundancy are two of the most common words in daily usage. The Charlie Waller Memorial Trust offers vital information on preventing depression and is producing tailored guidance for performers.